What motivates a person to drive 30 hours across three states to hold a wooden cross and pray for people? “The Spirit of God,” Michael Lyons answered without hesitation. With the heat nearing 100 degrees Sunday evening, Michael seemed unaffected. 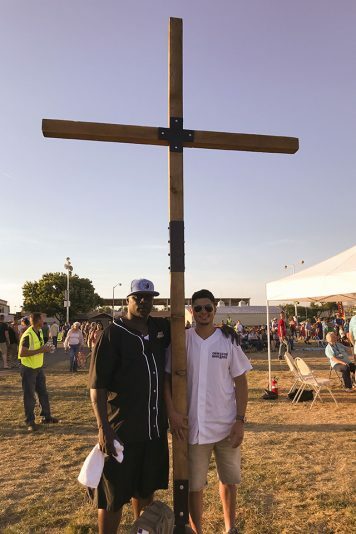 He held one side of a gigantic cross while his friend, Ernesto Vazquez, held the other. The men joined a handful of others from On Mission Ministries out of Longview, Texas, for the ninth and next-to-last stop on the Decision America California Tour in Chico. Like many in the crowd of about 5,200 Sunday, Michael was drawn to Silver Dollar Fairgrounds to experience something big. While several protesters with colorful posters stood at the entrance to the venue, dozens quietly poured past them, smiling as they carried their lawn chairs toward the field to get a good seat. Michael said he wants to see people turn their eyes to God who alone can revive the hopeless and heal the brokenhearted. He wants his fellow Americans to grasp the weight of their sin and the depth of Jesus Christ’s sacrifice for them—symbolized by the cross. Is there a sin that’s plagued your life? Know God’s forgiveness. 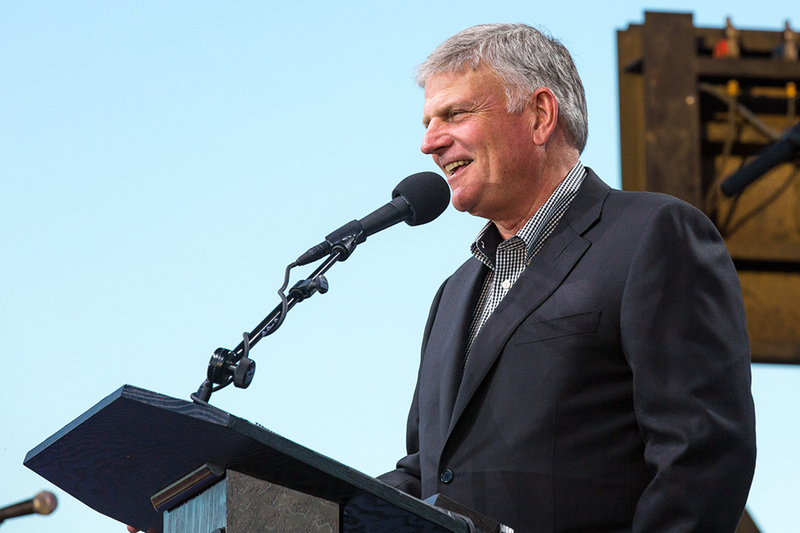 The purpose of the Decision America Tour with Franklin Graham is twofold: to spread the word about God’s plan to rescue His people from their sins, and to stand together in prayer for the state of California. Michael and Ernesto were in Longview last year when Franklin Graham came through on the Decision Texas Tour. And they were there this past week in Santa Clara and Berkeley, California, as Franklin has been making his way north across the Golden State. The Decision California Tour is nine stops down with one more to go. Join the final tour stop in Redding on Tuesday. 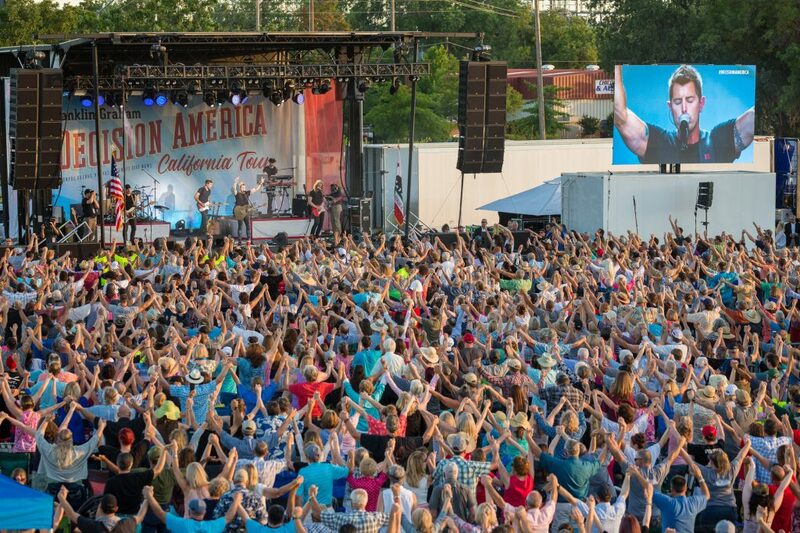 Situated an hour and a half north of Sacramento, Chico is a ways from the ocean, but it didn’t take long for the fairgrounds to turn into a sea of people, all there to praise God and petition Him to change their state. “Church, take your state back,” Franklin Graham firmly challenged Christians, reminding them how much power is behind prayer in numbers. He reinforced the value of Christians being involved in their communities and representing Christ, but spent most of the time asserting the heart and urgency of the Gospel. “[God] can give you a new beginning, a new life if you come to Him,” he said. The lively crowd blended color, race and gender as Franklin brought a message out of the book of Daniel in the Bible. He talked about King Belshazzar who was deep into idolatry but was drawn to the spirit of God in Daniel. Belshazzar had a change of countenance and attitude when confronted with the truth Daniel gave him. 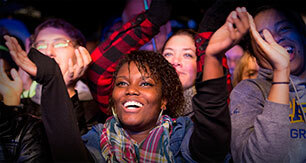 The spirited crowd sat silently as they listened to Franklin Graham read from God’s Word. It’s been only two-and-a-half months since Ernesto got married, but the newlywed said he’s spent a week away from his new wife now in order to follow God’s calling and be part of the California tour hours away from his hometown. Watching the fairgrounds fill up as the event began, security guard Brandon Bercamina said he didn’t expect so many people. 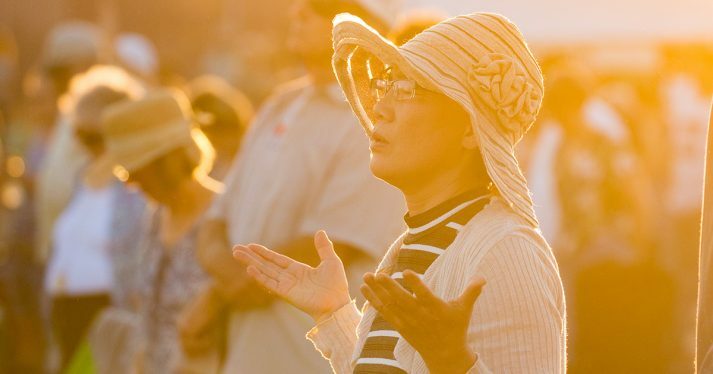 Yet it was evident the Holy Spirit was at work among the crowd; even as the sun went down, people prayed with fervor and worshiped with uninhibited enthusiasm. “If the Holy Spirit isn’t going to be there, there’s not going to be any change,” Michael warned earlier. From the looks of Chico, change is on the way. The last stop on the Decision California Tour is Tuesday, June 5, in Redding. Watch online at BillyGraham.org/live. The Holy Spirit was moving on Sunday night in Chico, the 9th stop on the Decision America California Tour.